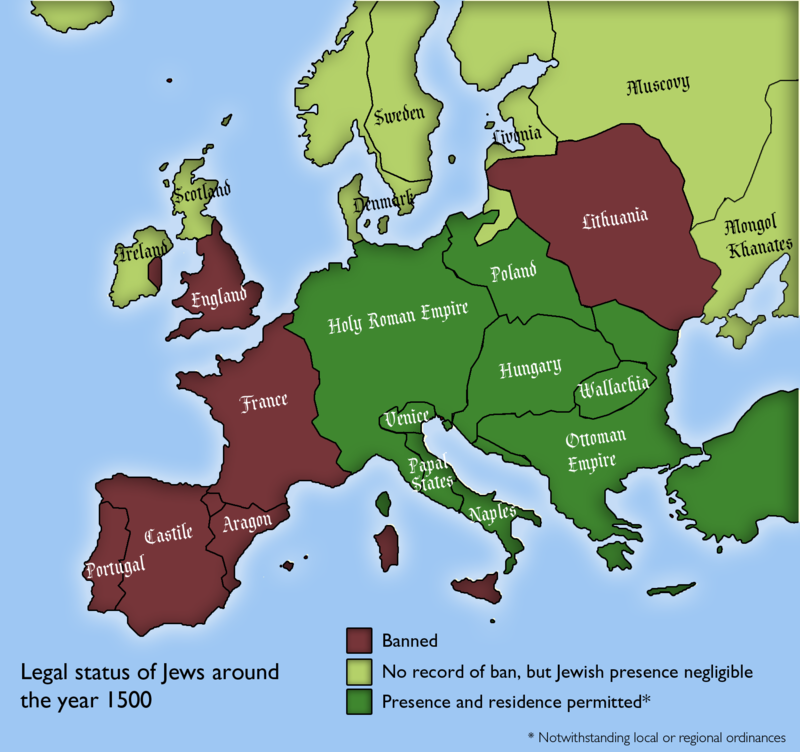 The map above gives a very general overview of the legal status of Jews in various major European countries around the year 1500. Interestingly, the two European countries with the largest Jewish populations today (France: 465,000; UK: 270,000) both had Jewish bans in 1500. And perhaps even more interesting is the fact that the Muslim Ottoman Empire allowed Jews to live in within it territory, while they were banned throughout much of Western Europe. Of course Europe in 1500 was far more fragmented than the map above shows and legal bans existed in various cities, towns and villages within countries and empires that allowed Jews to live. Moreover, the quality of life for Jews could vary widely by country and life was not easy in many more “accepting” countries. Map totally incorrect about Lithuania . Some of these bans remained legally in place for centuries. Spain only did away with its ban in the 1990’s. The map is not correct about Spain. Already existed as a nation in 1500. The status of the Jewish Community has improved a lot due to education.